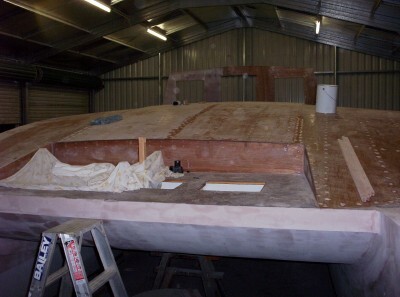 More than half the cabin top is now glued down, and the rest is cut ready to glue. That will have to wait for now until we return from a few weeks' holiday. Yesterday I stepped off the cabin top backwards and landed in the cutout for the deck locker. My hand got a few deep scratches on it where I grabbed hold of the glassed edge of the cutout, but at least I didn't fall overboard and land on the concrete! The battery for the cordless drill shattered, but the boat came through unscathed. 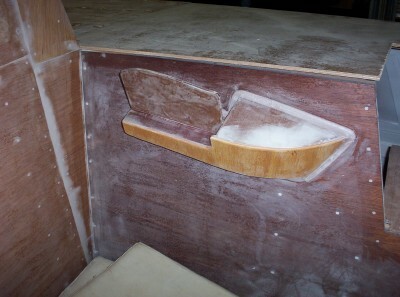 The cockpit seats are more or less done. 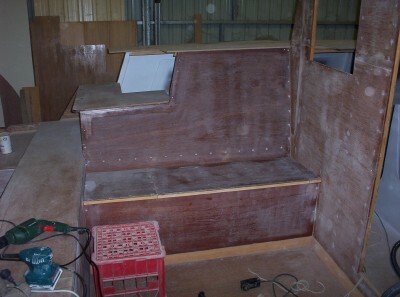 This shot also shows the shape of the step up to the cabin top, which I hope will be a comfortable helming position. I've got one of the two new model Yamaha 9.9GEX outboards, and had it mounted in position on both sides. This model also uses different forward controls to the previous models, and I've made up a console to house them (one for each motor) - it's high up on the starboard cockput seat within easy reach from the helm. It's a bit of a compromise, but I've seen it done on another Easy and it seems to work out OK.